Finally out of beta and with the new GeForce NOW name, Nvidia's game streaming service is finally open to all. Well, so long as you're already a card-carrying member of the SHIELD device family anyways. The company, most known for PC gaming hardware, is touting GeForce NOW - previously known as Nvidia GRID - as the 'Netflix for games'. With its £7.49 / month non-contract subscription, offering the ability to stream and play any game you want from its catalogue, the comparison is somewhat inevitable. And the comparison seems to make sense, though on closer inspection it might seem to be over-selling what GeForce NOW actually offers its subscribers, though is also guilty of not covering the impressive technical achievement and the extras it offers. In order to let you play the latest and greatest of PC games, at 1080p resolutions and at sixty frames per second, without needing anything more powerful than a SHIELD mobile device, GeForce NOW requires quite the back end hardware. When you game on GeForce NOW you are essentially playing on a supercomputer somewhere in the cloud. The GeForce NOW servers are packed with hundreds of Kepler-based Nvidia GPUs to power multiple concurrent game streams. The servers render and encode each game frame, sending them out to the user with minimal latency and reacts to the inputs sent back from the client SHIELD device in your hand. These powerful servers are situated around the world to ensure a decent connection wherever you're accessing the service from. GeForce NOW has just gone live in the EU, North America, Eastern Europe, Western Russia and Japan - that should give you a fair idea of just how many GeForce NOW servers there are around. For your £7.49 subscription you actually only get access to the Membership Games catalogue. 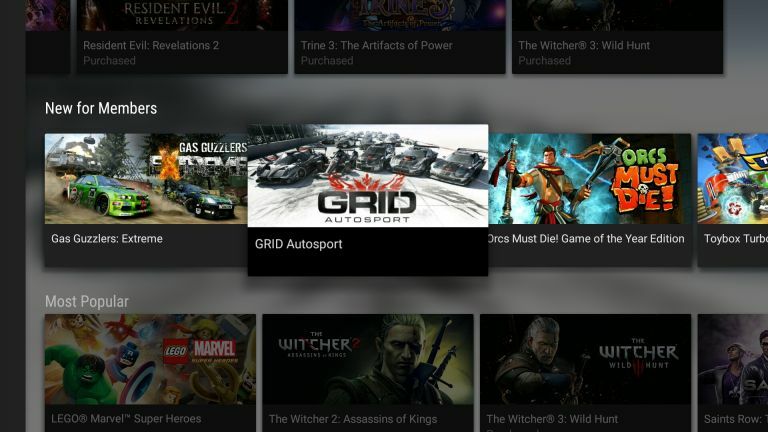 Currently there are only around fifty games in that section, though Nvidia has been adding to it on a fairly regular basis throughout the beta and remain committed to boosting the content its subscribers gain access to. That content however will also shrink on occasions too as certain games are removed. There is though a way to guarantee a game never disappears from the GeForce NOW stream - buy it. Part of the service allows you access to a store with premium games you can buy and stream instantly. Currently there are only eight games on offer to actually buy in the UK, though many of them come with digital download keys. The Witcher 3, for example, comes with a download code for GOG.com, while Saints Row IV gives you a Steam code. It's a nice feature which actually gives you something to own locally as well as for streaming, negating the feeling you're paying full price almost for renting a game. All that technological wizardry though ought to remain invisible to the gamer at the other end of the interweb tubes. The holy grail is for a streamed service to look and feel like it's being played on a local device. And GeForce NOW gets mighty close to that. When you're wired into the router, either via the adapter for the SHIELD tablet or the ethernet port on the SHIELD console, my experience of the service has been remarkably slick and robust. There is inevitably some latency to the game stream, somewhere in the region of 150ms, but that isn't a million miles away from what you get with a controller and a local games console. Even so, streaming fast-paced racing games like GRID Autosport at 1080p/60Hz is absolutely fine - I was still able to fling my open-wheel racing car around Brands Hatch like a pro. An old pro with failing eyesight, admittedly, but a pro nonetheless. Things weren't quite so good with Witcher 3, however. It wouldn't budge from 1080p/30Hz whatever I tried, even on my speedy home connection or in the T3 office. That makes it feel a little more jerky and I also experienced some skipped frames too. Given that it's a title Nvidia is asking a fair chunk of cash to buy and stream The Witcher 3 on its service that's a bit of a disappointment. It's also a little odd that there can be such a difference in the streaming of different games across the same connection. Using the SHIELD tablet in wireless mode though is a different experience. Without the wired connection the service generally hits a lower level of streaming fidelity, and even with a compatible 5GHz router and a speedy net connection I was getting a lot of missed frames, stuttering and occasionally complete drops in connection. GeForce NOW will keep your game running for a few minutes if you do get disconnected, so you will have time to jump back in and save your game to the cloud if the worst does happen. Nvidia's streaming service really is a tough one to recommend. The whole 'Netflix for games' thing makes you think of a vast repository of titles to gorge on, but in reality the currently restricted Membership Games catalogue of fifty titles doesn't feel like enough to warrant a regular sub. If it was committed to putting big games onto the access list as they were released that would be fine, but for such premium content you're being asked to pay again to purchase access and then pay a regular subscription to keep that access open. The digital download key somewhat negates those issues, and Nvidia will keep hold of your saves for five years even if you let your membership lapse in between. I also don't completely understand who it's actually aimed at. If you're spending at least £7.49 / month on your gaming habit I'd argue you're not really a casual gamer. Spend that much on Steam every month and you'll soon put together a very healthy PC gaming library, especially around sales time. As a more-than-casual gamer you're probably already going to have a local gaming system, whether it's PC or console, on which you play games in your home. And that's where GeForce NOW has to live because it needs a wired network connection or the power of a 5GHz router to deliver the necessary experience. That in turn means you're not going to be able to access the service over a mobile signal - a la Netflix - if you want to game on the go. So a monthly subscription has to be because you want a little more game for your SHIELD tablet or the ability to game on your TV with the SHIELD console. The restriction surrounding compatible devices is also a source of frustration. You need at least a 12Mbps download connection, with 50Mbps required for 1080p/60Hz playback. And if you want to go wireless you'll need a SHIELD-ready 5GHz WiFi router. And, to reiterate, you can only access GeForce NOW via a SHIELD device. There are tablets and set-top boxes with the sort of hardware to run GeForce NOW, even if it has to be a cut-down 720p version of the stream. So to restrict it only to the SHIELD ecosystem means there will be a very small pool of available gamers looking to take on a GeForce NOW subscription. There is a decent variety of titles on the Membership Games catalogue, with options for different genres, but it doesn't seem a large enough pool of gaming goodness to make you desperate to part with the cash on a regular basis. But I have to give it to Nvidia for actually making the service work. The technology behind GeForce NOW though is certainly powerful. So, in the end GeForce NOW is a pretty impressive game streaming service. But right now the relatively limited range of games you can access with your monthly sub, high network requirements and SHIELD-only device restrictions mean that it's only going to be of niche interest until it gets a little more opened up. Check out our review of the Nvidia SHIELD console.